Over the course of the next two weekends, folks in Seattle will have at their disposal two events catering to oyster addicts. If you love the briny bite of the bi-valve, these two events will be up your alley. This Saturday will be South Lake Union’s Oyster Frenzy, while next weekend’s will be Elliott’s Oyster House’s Oyster New Year Bash. I’m an unabashed oyster fiend. Love them. On the half-shell, in a stew, barbecued, roasted, whatever, I’m in for them. So events like these are totally up my alley. In fact, I went to Flying Fish’s Oyster Frenzy many years ago and was able to be a part of the gleeful carnage of shell and slurp. And it was awesome. But truth be told, this oyster appreciation has only kicked in during the latter third of my life. Growing up, my parents would eat oysters (roasted, never raw), but they never held an appeal for me. Clams and mussels I was fine with, but oysters, no way. As one does when they get older, I experimented. I’m glad I finally did and now I’m making up for lost time. Which is why events like Oyster Frenzy or Ocean New Year are up my alley. I get to binge. I’m really looking forward to next week’s Ocean New Year at Elliott’s Oyster House. I was invited to a ‘slurp-up’ a few weeks ago as a teaser to the event. Local oyster growers told us of the history of the bi-valve in our area. 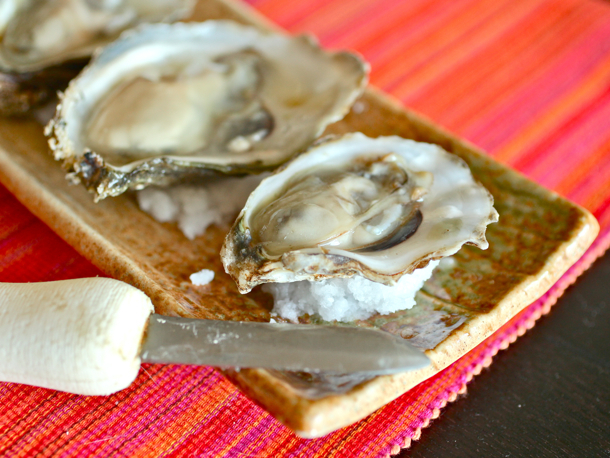 We tried out some of the wines that Jon Rowley noted as being ideal oyster wines. And we were able to indulge in fresh oysters and other seafood bites. All of this made me anticipate Elliott’s Oyster New Year bash (as part of their Ocean Harvest Festival) even more. On Saturday night from 5-9pm, Elliott’s will host a big bash with live music, a 90-ft bar, seafood buffet, wines from dozens of producers and more. An added bonus to the festivities is that all proceeds will benefit the Puget Sound Restoration Fund; a group with a mission to protect our waterways and the species calling it home. Look forward to seeing you around town; knee deep in oyster shells with the look of delirium that all oyster lovers have. See you around the shucking table.